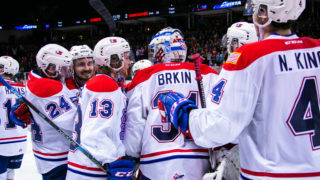 SPOKANE, Wash. – The Spokane Chiefs fell into an early hole against the visiting Lethbridge Hurricanes on Friday night and couldn’t climb out, dropping a 5-3 decision and moving to 1-2-0-0 on the year. Czech rookie forward Pavel Kousal scored his first career goal in the loss. The Hurricanes took advantage of four Chiefs penalties in the first period to score three power play goals, including one with a 5-on-3 advantage, on their way to a 3-0 lead late in the first period. Their second and third goals, scored by Tyler Wong and Ryley Lindgren, were just 33 seconds apart. Kousal scored with only 16 seconds left in the first, redirecting a cross-crease pass from Keanu Yamamoto, to cut the Hurricanes’ lead to 3-1. The Canes pushed Spokane’s deficit back to three goals with an unassisted breakaway score by Egor Babenko at the 1:31 mark of the second period. Spokane pulled within two again at the 4:17 mark with a power play goal from Jaret Anderson-Dolan. Keanu Yamamoto earned another assist, along with his brother Kailer, with another cross-crease pass to the waiting Anderson-Dolan. Rookie defenseman Calen Addison scored a surprising goal from beyond the blue line to give the Canes some insurance, as his dump-in from the neutral zone fooled starting goaltender Jayden Sittler and trickled in. 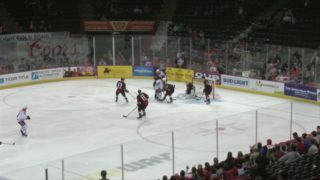 Keanu Yamamoto scored a goal of his own on a power play, taking a backhand pass from Anderson-Dolan and beating goalie Stuart Skinner at the 12:24 mark of the second. Spokane outshot Lethbridge 33-13, including 16-5 in the second period, but gave up three goals in seven penalty kill situations. They scored twice on five power plays. Sittler stopped eight of 13 shots in 27:30 while replacement Dawson Weatherill – in his first action as a Chief – turned aside all five shots faced to close out the game. Skinner made 31 saves in the full 60 minutes to earn second star honors. 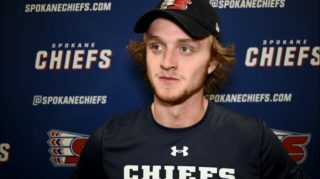 NOTES: The Chiefs also announced on Friday night that they had traded the rights to goaltender Matt Berlin to Seattle for a conditional pick in the 2018 WHL Bantam Draft. Berlin had appeared in seven games over two season for the Chiefs. 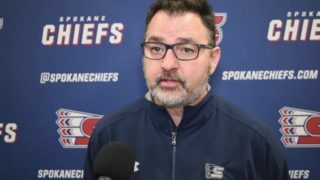 The Chiefs look to bounce back tomorrow night with a matchup against the Victoria Royals at Spokane Arena. 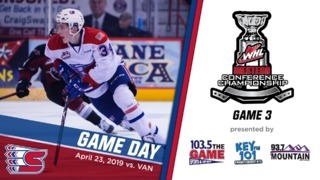 It will be the Spokane Chiefs’ $20,000 Shootout as one lucky fan will have a chance to win $20,000 at the game. 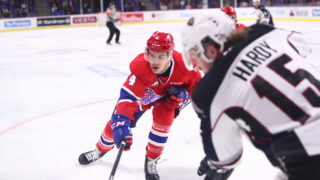 Tickets for Saturday night and all Chiefs home games are available in-person at the Chiefs’ Ticket Office, over the phone at 509-535-PUCK and online at spokanechiefs.com and ticketswest.com.